EcO2-Greece was established in March 2008 with the participation of EcO2 BV and AgroSpeCom Ltd. The company specializes in application of alternative methods towards eliminating insects. The mother company EcO2 BV based in the Netherlands has been active around the world using ‘green’ methods (www.eco2.nl). 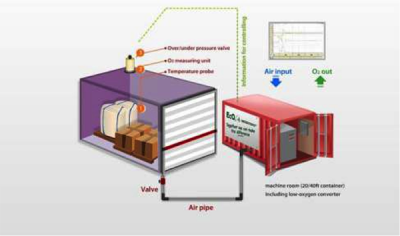 The methodology of fumigating with modified atmosphere refers to placement of products into an airtight closed chamber and supplying nitrogen until the oxygen level to fall below 1%. In these atmospheric conditions all stages of insects are killed. The method of modified atmosphere EcO2 offers a realistic commercial option without using chemicals for destroying insects in products. Simple chambers (like refrigerators) may be manufactured in production or storage areas at each plant. This method can be found in various applications and also in silos. No insects grow in the product. It takes the same time as the Phosphine application (3-8 days). There is no use of chemicals and therefore no residue. Can be used at any time without waiting for the contractor. An Internationally recognized certificate is issued at the end. Does not develop resistant insects. Has a minimized risk to personnel. It is a cost-competitive application. 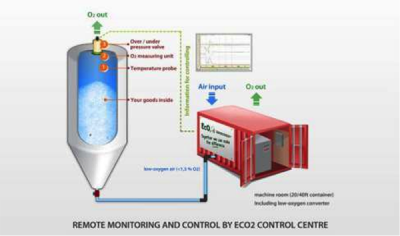 Apart from building chambers for customers, AgroSpeCom offers a logistics service incorporating the EcO2 Modified Atmosphere system. 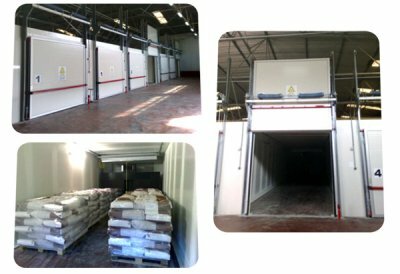 AgroSpeCom owns 3 chambers of controlled atmosphere in Inofyta, a special “clean room” area and and a loading lobby. These are located in the Transcombi logistics warehouse, which is a space of 1,500 m2 in Inofyta. The dimensions of each chamber is 15 m long, 3.5 m wide and 4.5 m high. The clean room occupies 1,200 m2 hall and the loading area of 100m2.